1990 Nigel Mansell Ferrari Agip Sint 2000 Poster. A great poster, issued by Agip UK in 1990 which takes advantage of the Agip sponsorship of Ferrari and especially Briton Nigel Mansell. 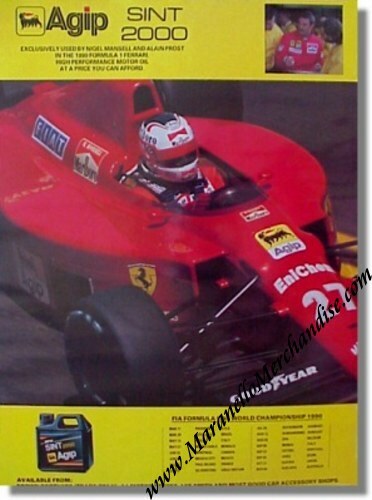 The poster shows Nigel in his Ferrari F1-90 + a smaller inset of Nigel in his Ferrari Marlboro race overalls. The bottom part lists all the GP of the 1990 season and a reseller's address. It measures approximately 22 x 17 inches or some 57 x 42 cm. Will be shipped rolled in a study tube.